The World Trade Report is an annual publication that aims to deepen understanding about trends in trade, trade policy issues and the multilateral trading system. 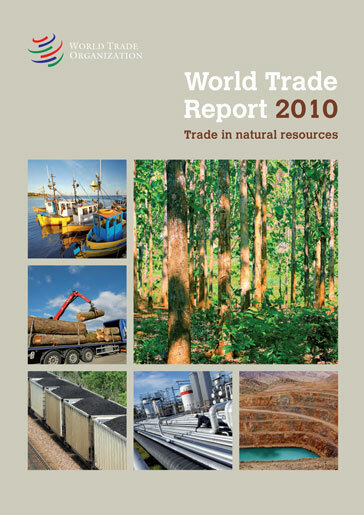 The 2010 edition, “Trade in Natural Resources”, was published in July 2010. This Forum seeks to promote an informed debate on trade in natural resources — the topic of the World Trade Report 2010. Documents posted on the Forum are the sole responsibility of their authors. They have no legal effect on the rights and obligations of WTO members, nor do they imply any judgement on the part of the WTO Secretariat regarding the consistency of any policy with the provisions of the WTO agreements. It is clear that natural resources present special challenges for policy makers since sound management and appropriate international rules are required to balance the competing needs of current and future generations in both exporting and importing countries. In this context, WTO rules play an important role in the system of global governance. In the run-up to publication of this year's Report, we invited WTO delegates, non-governmental organizations (NGOs), academic experts, WTO staff members and all those with an active interest in natural resources to submit short articles (of no more than 1,000 words) on the topic of the 2010 Report. Many of these are published below along with comments delivered at the launch of the Report. Is FDI in natural resources a “curse”? Trade in natural resources: are there any gaps in the rules? by Gal Hochman (Energy and Bioscience Institute) and David Zilberman (Professor, Department for Agriculture and Resource Economics; Energy and Bioscience Institute), UC Berkeley. Trade and Deforestation: What have we found? To what extent are WTO rules relevant to trade in natural resources? Trade in natural resources and the business community: what is at stake? What will the World Trade Report 2010 be about?